Changing the world seems like a daunting task, especially if it means going up against the powers that be, with their mountains of money and their entrenched privileges. It seems as if those who are on top today will be on top tomorrow and every tomorrow after that. The rich get richer, and the middle class stagnates, we are told. And while this complaint ignores many pertinent facts—especially income mobility and technological progress—there is certainly a lot of truth to the idea that those with political pull often do their best to rig the game in their favour. Bankers who get bailed out by government when they screw up are only the most obvious example. Yet things do change, which suggests that the powerful are not always as powerful as they appear to be. After all, if they were, they would presumably hold on to their privileges indefinitely. 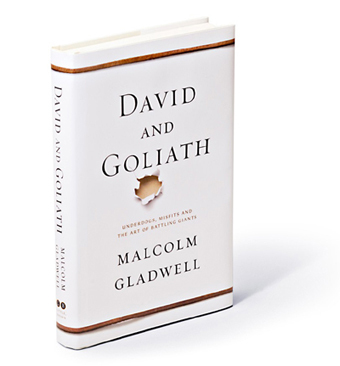 The flipside of that, as Malcolm Gladwell illustrates in David and Goliath: Underdogs, Misfits, and the Art of Battling Giants, is that the seemingly powerless are not always as powerless as they appear to be. In the biblical story that gives the book its title, for instance, David appears to be the underdog against the big, strong, heavily armed and armoured Goliath. But in fact, as Gladwell explains in his introduction, the sling that David carries is a powerful weapon. At a distance of 35 metres, a typical stone hurled by an expert slinger—which David was—would have had the stopping power of “a fair-sized modern handgun.” Sometimes, when you dig a little deeper, it turns out that the apparent underdog is really the favourite. Gladwell’s book is a wide-ranging (or less generously, a meandering) exploration of “what happens when ordinary people confront giants,” which includes people facing off against all manner of misfortune and obstacle. There is the high school basketball coach who uses an unorthodox strategy to frustrate more talented teams. There’s the dyslexic who rises to the top of the legal profession by becoming a superb listener to compensate for his reading difficulties. There is the curmudgeon who lost his father very young and whose mother worked 18-hour days to make ends meet, but who grew up to become a doctor and ended up doing pioneering work in the treatment of childhood leukemia. There are the famous Impressionist painters who, struggling and broke, challenged the Parisian art establishment in the 1870s, and won. But enjoyable as these anecdotes are, the real meat of Gladwell’s book is the stuff about people resisting the political power of armies and oppressors. For instance, of all wars over the past 200 years between very large and very small countries—with one of them at least ten times larger than the other—it turns out that the weaker side has won almost one third of the time. When the weaker side has refused to play by the stronger side’s rules and instead used “unconventional or guerilla” tactics, the apparent underdog won almost two thirds of the time. A crucial issue is that of legitimacy. Martin Luther King Jr. and the civil rights activists of the 1960s were “outgunned and overmatched,” but they overcame the oppressive Jim Crow laws of the day by challenging their legitimacy. The powerful British Army was unable to impose its will on the underdog Catholics in Northern Ireland in the 1970s because it lacked legitimacy in their eyes. Similarly, law and order on American streets succeeds or fails to keep the peace in part based on perceptions of legitimacy. Turns out, sheer power isn’t everything. Gladwell doesn’t go so far as to question the legitimacy of government itself, in all its forms, the way Michael Huemer does in The Problem of Political Authority. But his anecdotes and arguments nonetheless perform a valuable service in getting us to question the nature of power. If enough people decide that their governments can’t do a certain thing—discriminate against blacks or impose a curfew on Catholics—it is difficult for even a powerful government to enforce its commands. As things like the Drug War and central banking lose their legitimacy, those of us who value free markets and freedom more generally may soon find that we are only apparent underdogs in our battles against Goliaths like the DEA and the Fed. The real battle is over ideas. When our ideas change, our rulers must sooner or later follow suit. The more we realize we can get along just fine without all of the government functions we now take for granted, the less those rulers will be able to get away with manipulating and controlling us in the name of the greater good. ▪ What Does Greenpeace Have Against Golden Rice? ▪ Dear Sugar Man: Does a Nation Really Need a Charter of Values?